Durga Puja is the greatest festival for Bengalis and is dedicated to the worship of Goddess Durga. Any Bengali celebration is incomplete without traditional music. The songs and dance complement the aura of the festival, marking the nine-day festival which is an integral part of not only Bengali but the overall Indian culture. If you want to make Durga Puja as special as it gets, then Saregama has the perfect gift for you – the Saregama Carvaan Bengali. Saregama Carvaan Bengali is a digital audio player, which comes pre-loaded with 5000 Bengali and Hindi film songs, folk songs, devotional songs and Tagore songs. These songs are categorised by genres, moods and artists. The device is portable weighing just 1.3 kgs, making it perfect to carry around. The stereo speakers allow you to play the songs aloud and for long as its battery lasts for five hours after a full charge. All you have to do is turn the knob, and enjoy everything from Sharadiya songs to Tagore’s compositions. Saregama Carvaan is a perfect gift for music lovers as besides the 5000 evergreen songs inside, it comes with a USB port giving you the independence to listen to your personal collection of songs. It can also be connected to your phone via Bluetooth, as well as, stream radio stations from the device without hassles. The device comes with a remote to execute actions at the power of a button from the comfort of your chair. From Hemanta Mukherjee to Kavi Nazrul, to the traditional songs of Tagore, retro hits of Kishore Kumar, all are available in the Saregama Carvaan. The dedicated station for Tagore songs covers all his collections like Prem, Puja, Prakriti, and Bichitro, make it a must-have for all Tagore lovers. 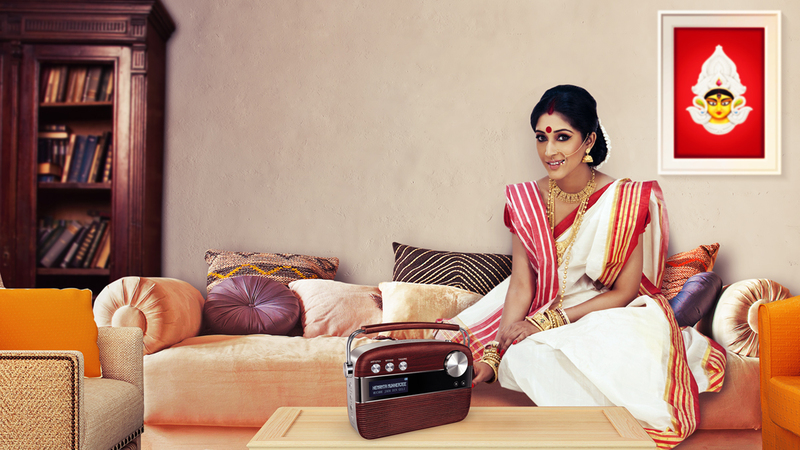 The Saregama Carvaan Bengali is available in two colours; Cherrywood Red and Porcelain White.